The site is a former waste water treatment works located to the south east of New Stevenston. The site is being developed by Robertson Homes for residential use . An unnamed burn is located on the western and southern boundaries of the site – this is considered to be the prime receptor of concern. 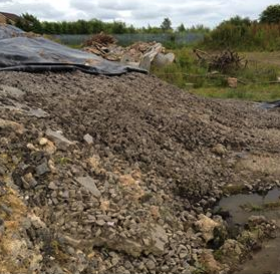 A stockpile of excavated filter media remained on-site following the decommissioning of the water treatment works – this stockpile comprised of primarily stone material with associated soils – the stockpiled material was contaminated with metallic and hydrocarbon pollutants. The client required the material to be treated for reuse on-site – the costs for offsite disposal were considered to be prohibitive. The intention was to reuse the material as sub-base (6F2) material for a car parking area – the material was considered to be suitable for this purpose due to the high stone content. Envirotreat produced a Site Specific Working Plan outlining the site history, identified contamination issues, proposed remediation strategy & technical rationale, environmental protection measures required during the remediation works, conditions for reuse and validation protocols for the treatment element of the works. The human health concerns were addressed by the proposed reuse of the treated material under a designated area of hardstanding (car parking area) – this was considered to be an effective pathway break for human health protection. The prime environmental concern was the protection of the water environment – this was confirmed by SEPA to be the underlying groundwater and the unnamed burn bordering the site (surface waters). Remediation target criteria [RTC] were determined for lead, benzo(a)pyrene and total petroleum hydrocarbons – the derived leachate target values were agreed with the regulatory bodies. The SSWP was approved by North Lanarkshire Council and SEPA prior to commencement of the remediation works. The proposed remediation strategy involved the use of E-Clay Stabilisation to treat the materials for the purpose intended.